To create many of his iconic, quintessentially American paintings, most of which served as magazine covers, Norman Rockwell worked from carefully staged study photographs that are on view for the first time, alongside his paintings, drawings, and related tear sheets, in Norman Rockwell: Behind the Camera. If a model has worn a red sweater, I have painted it red—I couldn’t possibly make it green.…But when working with photographs I seem able to recompose in many ways: as to form, tone, and color. 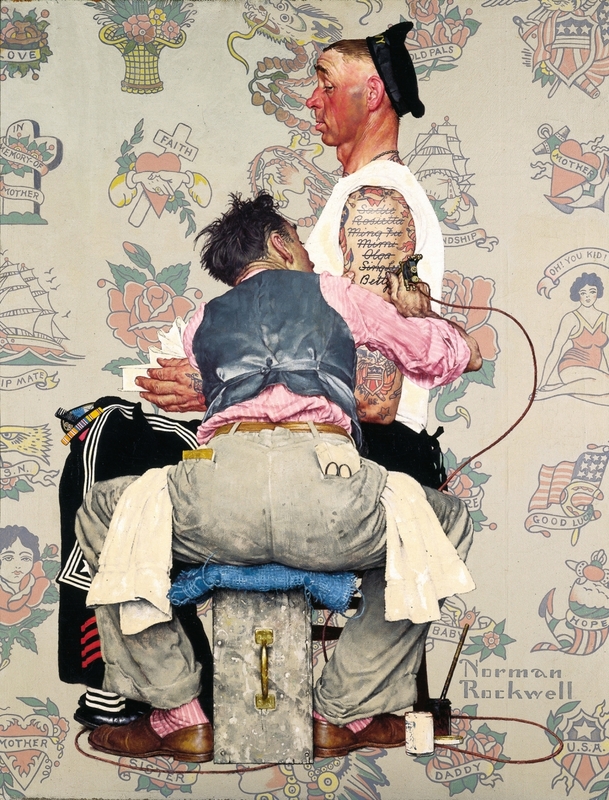 To create many of his iconic, quintessentially American paintings, most of which served as magazine covers, Norman Rockwell worked from carefully staged study photographs that are on view for the first time, alongside his paintings, drawings, and related tear sheets, in Norman Rockwell: Behind the Camera. The exhibition, which will be on view at the Brooklyn Museum from November 19, 2010, through April 10, 2011, was organized by the Norman Rockwell Museum in Stockbridge, Massachusetts, following a two-year project that preserved and digitized almost 20,000 negatives. 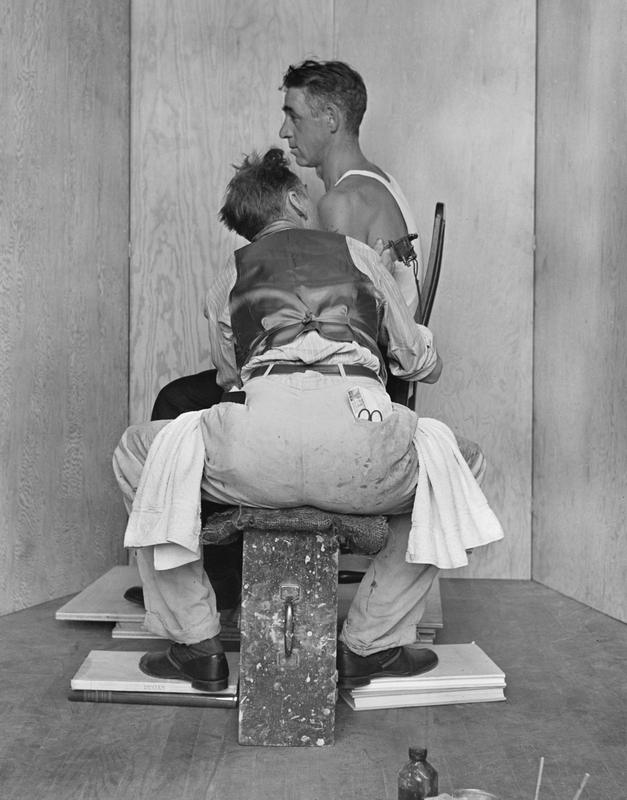 Beginning in the late 1930s, Norman Rockwell (1894–1978) adopted photography as a tool to bring his illustration ideas to life in studio sessions. Working as a director, he carefully staged his photographs, selecting props, locations, and models and orchestrating every detail. He began by collecting authentic props and costumes, and what he did not have readily available he purchased, borrowed, or rented from a dime-store hairbrush or coffee cup to a roomful of chairs and tables from a New York City Automat. He created numerous photographs for each new subject, sometimes capturing complete compositions and, in other instances, combining separate pictures of individual elements. Over the forty years that he used photographs as his painting guide, he worked with many skilled photographers, particularly Gene Pelham, Bill Scovill, and Louis Lamone. Early in his career Rockwell had a studio in New Rochelle, New York. He later moved with his wife and three sons to Arlington, Vermont, where many of his family and neighbors served as models in working photographs for his illustrations, which began to focus on small-town American life. In 1943 a fire destroyed his Vermont studio, along with numerous paintings and many of the photographic studies. 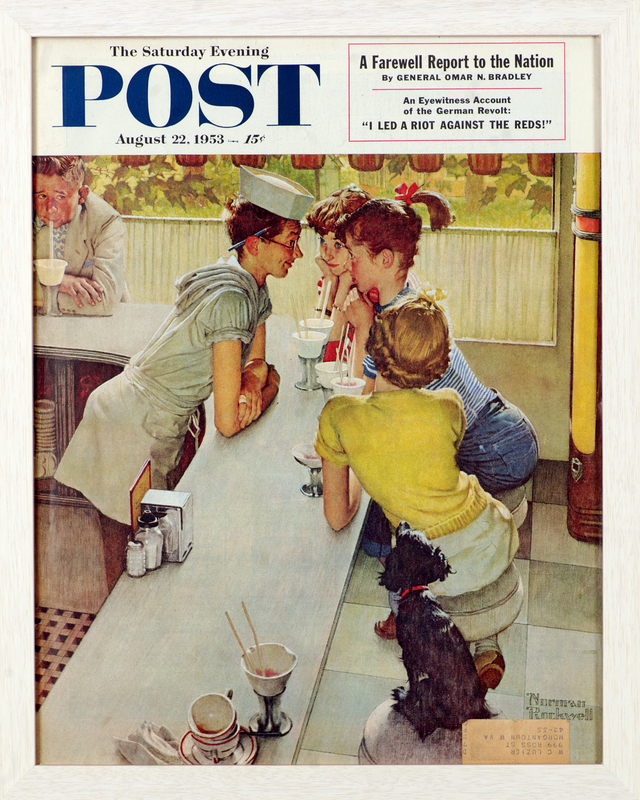 year association with The Saturday Evening Post and began to work for Look magazine, where, during his ten-year association, he produced work that reflected his personal concerns, including civil rights, America’s war on poverty, and space exploration. Norman Rockwell (American, 1894 to 1978). The Tattoo Artist, 1944. Cover illustration for The Saturday Evening Post, March 4, 1944. Oil on canvas. 43 x 33 in. Collection of the Brooklyn Museum Gift of the artist, Copyright 4SEPS: Curtis Publishing, Indianapolis. Gene Pelham (American, 1909 to 2004). Photograph for The Tattoo Artist, 1944. Study for The Saturday Evening Post, March 4, 1944. 11 1/4 X 8 3/4 inches. Norman Rockwell Museum Archival Collections. Norman Rockwell Licensing, Niles, Illinois. Norman Rockwell (American, 1894 to 1978). Soda Jerk, 1953. Tear sheet, The Saturday Evening Post, August 22, 1953. 13 5/8 x 10 5/8. Norman Rockwell Museum Archival Collections. Copyright 1953SEPS: Curtis Publishing, Indianapolis. Gene Pelham (American, 1909 to 2004). 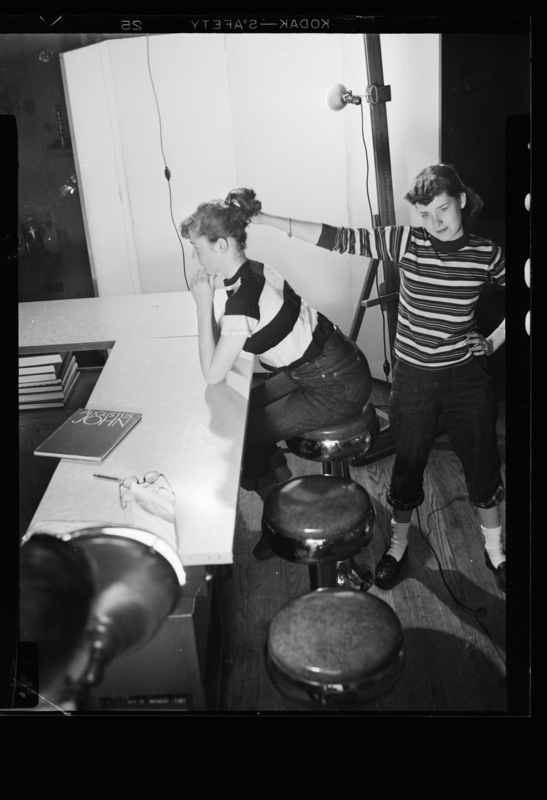 Photograph for Soda Jerk, 1953. Study for The Saturday Evening Post, August 22, 1953. 11 1/4 x 8 5/8 inches. Norman Rockwell Museum Archival Collections. Norman Rockwell Licensing, Niles, Illinois.